Click HERE to see group checklist and photos from our 2014 tour. Click HERE to see group checklist and photos from our 2013 tour. Click HERE to see group checklist and photos from our 2012 tour. Come with us to one of the most famous birding destinations in the world - the renowned Canopy Tower in central Panama. Our tour includes 5 nights at the Tower and 5 nights at the Tower's sister facility, the lovely Canopy Lodge in El Valle de Anton. Birding at different elevations and in a variety of habitats affords us the opportunity to see a more diverse array of species. For convenience, our last night will be spent near the airport. The following itinerary is a proposal and will not necessarily be followed in the exact order given. We will visit every site on the itinerary, but the guides will select the sequence to follow based on current conditions and bird sightings at the time of the tour. Arrive at Panama's Tocumen International Airport, where a representative from the Canopy Tower will meet you and provide transportation to the Tower. You will awake this morning to the sounds of the rain forest that surrounds the Canopy Tower. The Canopy Tower provides a prime location from which to observe the birds and other wildlife of the forest canopy. From the tower, the wildlife is right at eye level, and it is normal to get fantastic views of birds you would hardly see otherwise. You don't have to leave the tower to find birds; you don't even have to leave your bedroom! 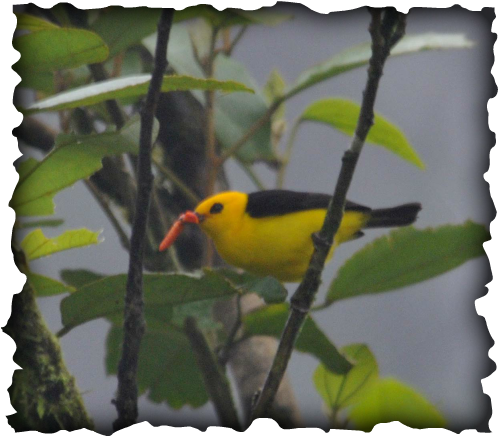 Tanagers, Toucans, and Tityras can be seen right from your window. The dining area and the roof of the tower are extraordinary for finding elusive canopy birds, as well as Howler Monkeys, Sloths, Tamarins, and other mammals. Before breakfast today, we will spend some time on the observation deck searching for some of the myriad of species that inhabit the surrounding forest. Some of the bird species we are likely to see are Green and Red-legged Honeycreepers, Green Shrike-Vireo, Palm Tanager, Blue Dacnis, Keel-billed Toucans, Collared Aracari, and many others. The possibilities are limitless! After breakfast, we will start exploring the forests of Central Panama as we walk down Semaphore Hill Road. This paved road, which serves as the entrance road to the Canopy Tower, is a little more than a mile long and passes through Soberania National Park. Here you will get a chance to see birds and mammals, such as Antbirds and Agoutis, that spend their lives close to the forest floor. The bird list of Semaphore Hill Road is extensive and includes birds from the forest interior as well as edge dwellers. Olivaceous Flatbill and White-whiskered Puffbird are common; Slate-colored Grosbeak, Gray-headed Tanager, and Broad-billed Motmot are seen frequently. Great Tinamou and Marbled Wood-Quail are present, often heard but to see these secretive ground-dwellers takes some effort. The road is also great for raptors: Tiny, White, and Bicolored Hawks have been seen here. During migration it's easy to see more than ten species of warblers and migratory songbirds in one morning, especially striking during spring when birds are sporting their breeding plumages. When we get to the bottom of Semaphore Hill Road, we will be driven back to the top in one of the Canopy Tower's specialized vehicles. The Birdmobile and Rainfomobile were designed specifically for birding, with open air seating that allows for unobstructed views in every direction. We will enjoy lunch and a short rest before venturing out for our afternoon excursion to the Ammo Dump Pond. The Ammo Dump Pond is located just north of Gamboa, on the way to Pipeline Road. It is the best place to see the elusive White-throated Crake, as well as a host of other water birds. Least Grebes, Common Moorhens, and Purple Gallinules are common while Rufescent Tiger-Heron and American Pygmy Kingfishers are present but more difficult to find. Occasionally Limpkins are sighted, and maybe with some luck, Least Bitterns. Snail Kites have recently taken up residence at the Ammo Dump Ponds as well. We will return to the Canopy Tower in time for a warm shower before dinner. This morning we will walk along the old road to Gamboa , an area rich in birdlife. At the beginning of the unpaved road we'll stop at Summit Ponds, where Boat-billed Herons nest and Capped Herons are occasionally seen. Both Great and Lesser Kiskadees, as well as both Green and Striated Herons are often seen, allowing for comparison of these pairs of similar species. Passing between the two ponds, you will find yourself on Old Gamboa Road South, one of the birdiest spots in the canal zone. The road passes through a variety of habitats, and has plenty of specialties: Blue Ground-Dove, Great Antshrike, Jet Antbird, Black-tailed and Royal Flycatchers, Lance-tailed and Golden-collared Manakins, and Rosy Thrush-Tanager to name but a few. A pair of Spectacled Owls have nested in this area for several years. When we return and head north of the ponds, we could encounter species such as White-bellied Antbird, Yellow-bellied Elaenia, Yellow-backed Oriole, Boat-billed Flycatcher, Fork-tailed Flycatcher, Yellow-headed Caracara, and more. Back again to Pipeline Road, one of the premier birding sites of the Americas. The Rainfomobile allows us to explore the second half of Pipeline Road, which offers the possibility of new species because of its overlap with the Atlantic area. We'll be on the lookout for ant swarms that attract nice mixed flocks as well as White-necked and Black-breasted Puffbirds, Antpittas, Great Jacamar, Black-tailed Trogon, Crane Hawk, Black Hawk-Eagle, Cinnamon Woodpecker, Black-striped Woodcreeper and many other species. In 2010, we watched (and filmed - see video clip below) a Streak-chested Antpitta as it swelled up and then deflated its chest as it released its sorrowful cry. Because the road is long and offers many possibilities, we will have a picnic lunch somewhere in the forest. No siesta today! Today, we'll spend some time on the observation deck before breakfast, enjoying one last morning overlooking the canopy. After breakfast we will descend Semaphore Hill Road to the entrance of Plantation Road. Here, we will walk for a few hours along the easy graded dirt road that passes through a mature forest. The road follows a small creek, Rio Chico Masambi, where sometimes a Louisiana Waterthrush spends the winter. We have encountered nesting Sunbitterns on this creek, as well as Caimans. Golden-crowned Spadebills are regular aroung the creek, and White-breasted Wood-Wrens are very easy to find. In most places, the forest is clear of undergrowth, making it especially suited for observing shy, interior forest birds like Tinamous and Leaftossers. If we are lucky enough to come upon an Army Ant swarm, we should have good views of the birds that are attracted by the ants: Spotted, Bicolored and Ocellated Antbirds, Gray-headed Tanagers, Plain-brown, Northern Barred and Ruddy Woodcreepers, among others. We will return to the Tower in time for a mid-morning departure for the Canopy Lodge, where we will spend the next five nights. If we have enough time, we will stop at the market on our way through El Valle de Anton, a lovely village nestled in the crater of an extinct volcano that exploded five million years ago. Located in El Valle de Anton, the lodge offers a bit of luxury amid the unique scenery of the dormant volcano - a steep valley surrounded by jagged peaks and filled with flowers, streams, and verdant forests. The lodge was built next to a lovely mountain stream and is adjacent to the protected area of Cerro Gaital Natural Monument. We plan to arrive midday, and will have lunch in the lodge's open-air dining room shortly after we arrive. Once we have settled into our rooms and have had time to observe some of the birds in the garden and at the feeders, we will walk with our guides along the entrance road to the lodge to see what we can find. Some of the species we might expect to see near the lodge include Crimson-backed, Blue-gray, Dusky-faced and Plain-colored Tanagers, Social Flycatcher, Ruddy Ground-Dove, Barred Antshrike, Yellow-faced Grassquit, Rufous-tailed, Blue-chested, Snowy-bellied and Violet-capped Hummingbirds, Clay-colored Robin and Orange-billed Sparrow, among others. Verbena bushes near the lodge have hosted Rufous-crested Coquettes for the last few years, so we have a good chance of spotting this cute little hummingbird. Today we will wake up early and go birding around the mountain trails surrounding the crater where it is possible to find one of the most sought-after species in neotropical birding, the Rufous-vented Ground Cuckoo. This area also offers frequent sightings of Emerald Toucanets, Orange-bellied Trogon, Spotted Barbtail, Common Bush-Tanager, Black-faced Grosbeak, Rufous-capped Warbler, Gray-headed Kite, Tawny-capped Euphonia, White-tailed Emerald, and Violet-headed Hummingbird, to name a few. If we are lucky we might see a Scaled Antpitta or a Black-headed Antthrush. After lunch and a bit of a rest, those who wish to do so will have the opportunity to experience the Canopy Adventure (extra fee approximately $65), a series of zip lines high in the canopy by which travelers can explore the rain forest using safe and modern climbing equipment. The Canopy Adventure is located in a private refuge in the foothills above El Valle. The main attraction of this refuge is a beautiful 150 feet high waterfall called Chorro Macho. The birdlife and the flora are especially rich and diverse because the area has been a wildlife refuge for several years. The principle purpose of this refuge, apart from the obvious task of keeping the area free from poachers and loggers, has been to provide sustainable, nature-based employment to ten young men who would otherwise be cutting down the forest through slash and burn agricultural methods in order to survive and raise their families. The refuge is a way to keep the forest ecosystem whole while providing much needed employment. After an invigorating short climb to the top of the ridge through bird-rich forest, you strap in and soar through the treetops, where you see a wealth of natural beauty and activity. Swooping from platform to platform among the sturdy cloud forest trees, you pass over the stream and waterfall not once, but twice. For those not interested in the Canopy Adventure, other options are available for the afternoon. You may go swimming in one of two natural pools, either at the lodge or near the entrance to the Canopy Adventure, or you may opt to walk with the zipline group to bird along the way to the first platform. Broad-billed Motmots, White-tipped Sicklebills, Dull-mantled Antbird, Bananaquit, Green and Stripe-throated Hermits, and Dusky-faced and Tawny-crested Tanagers are often found along this trail. Your tour leaders will walk back to the entrance with you while the others enjoy their descent via ziplines. Other options would include relaxing in the lounge area overlooking the garden and feeders at the lodge or exploring the trails on the lodge property. Today we will have an early breakfast and travel outside El Valle to visit a patch of dry forest just one hour away near the small village of El Chiru. The contrast with the lush and wet foothills of El Valle is dramatic. This habitat consists of relatively permanent growth of low and often straggly bushes and small trees with grass interspersed. It is a distinctive habitat of the Pacific lowlands and there is little of it left because most of the population in Panama has settled in the Pacific Coast. We will search for Pale-eyed Pygmy-Tyrant, Crested Bobwhite, Rufous-browed Pepper Shrike, Brown-throated Parakeet, Blue Ground Dove, Fork-tailed Flycatcher and Pearl Kite among other feathered residents of this scarce scrubby area. Bird activity is high during the first few hours, after which it gets hot and it will be time to return to the much cooler foothills. We will have lunch back in the Canopy Lodge, or perhaps enjoy lunch at a private beach. Afterwards, depending on our lunch location, we might visit a rice farm that attracts many birds, or if we are back at the Canopy Lodge, we will bird the La Zamia Trail at the base of the Cerro Gaital Natural Monument. This is an easy, level trail in which the rare Rufous-vented Ground Cuckoo has been seen occasionally. We will also look for the Blue-crowned Motmot, Common Potoo, Sepia-capped Flycatcher, Little Tinamou and Gray-headed Chachalaca. Another day of birding in the foothills will take us early in the morning to the northern rim of the crater to explore the trails of the Chorro Macho private reserve. Some very special birds have been sighted here, including the majestic White Hawk, the tiny Tody Motmot, the melodious Striped Cuckoo, and the elegant Sunbittern. Some colorful tanagers and honeycreepers are expected here as well, including Silver-throated, Golden-hooded and Bay-headed Tangers along with Blue and Scarlet-thighed Dacnis. This trail will offer good possibilities of seeing Brown-hooded and Blue-headed Parrots, Squirrel Cuckoo, Wedge-billed Woodcreeper, Black-chested Jay and Crimson-crested Woodpecker. Today we will take a tour to Altos del Maria, a gated mountain residential community that offers excellent accessible montane habitat at elevations of up to 3800 feet above sea level. As we enjoy a pleasant break from the heat and humidity of lower elevations, we will be on the lookout for species that prefer the cooler temperatures and the accompanying vegetation of the highlands. Black-and-yellow Tanager, Slate-colored and Black-faced Grosbeaks, Scarlet-thighed Dacnis, White-vented Euphonia, Gray-breasted Wood-Wren, Ochraceous Wren, Long-billed Gnatwren, White-ruffed Manakin, Rufous-browed Tyrannulet, Common Tufted Flycatcher, Slaty Antwren, Yellow-eared and Emerald Toucanets, Barred Forest-Falcon, Band-tailed Barbthroat, and Snowcap are some of the species we might expect to see here. After some morning birding and a hearty lunch at the Canopy Lodge, we will depart for Panama City. We will arrive at the Miraflores Locks of the Panama Canal in time to tour the museum and observe ships traveling through the locks. Afterwards, we will enjoy farewell dinner at the Riande Aeropuerto Hotel, where we will spend the night. Deposit of $600 with registration. Balance is due Dec. 16, 2017.